Panasonic boasts that their DMC-G3 Mirrorless Micro Four Thirds Digital Camera Kit, with the G Vario 14-42mm f/3.5 - 5.6 lens included, is even better than the company's G2. With an enhanced 16Mp sensor, a Free Angle touch LCD, improved access thanks to the mode dial, and other numerous enhancements, it would appear they're right. One way in which the G3 didn't change is that it still provides the user with the versatile Micro Four Thirds lens mount for attaching any number of Four Thirds lenses, and then some. That means the photographer will have all the advantages of a large DSLR camera, in a compact body. There's no compromise when traveling - both the ability to move quickly with light weight gear and to take creative images are available when shooting with a Micro Four Thirds camera. And with this kit, a versatile 14-42mm lens allows the photographer to get started taking amazing stills and shooting outstanding videos from day one! Of course, the G3 also shoots 1080i HD video! What digital camera worth its salt doesn't these days? Knowing that HD DSLR video is the wave of the future and a driving force behind the Micro Four Thirds movement, Panasonic was sure to include 1920 x 1080/60i capture. Features like a built-in stereo microphone and a live viewfinder help the user to capture impressive movies. Using the aforementioned HDMI connection, those same movies can be outputted to an HDTV for immediate viewing on the big screen. Whether the shooter is capturing stills or video, the lens options for the G3 are impressive. The Micro Four Thirds mount allows for 11 lens options from the Lumix G MFT System. There's even a 3D lens available for capturing 3-dimensional and 2D images simultaneously. In addition, lens adapters are available for mounting Leica M and Leica R lenses and older Lumix full Four Thirds lenses. In addition, many Lumix MFT lenses feature optical image stabilization, which helps to prevent blur or un-wanted motion. The DMC-G3's 3.0" free angle touchscreen LCD helps the shooter to capture from numerous angles, and to replay video and stills with ease - whether it's an audience of one, or the entire family is gathered around. The touch controls on the LCD allow for navigating the menu, focusing, and playback, along with triggering the shutter. Other noteworthy features include the camera's mode dial and hot shoe. The mode dial enables fast access to common camera modes like Aperture Priority and Manual, and it also provides access to additional settings, including two custom modes, scene modes, and the Creative Control Mode. In addition, there's also a dedicated video button that can activate video capture without requiring that the camera modes change. Additionally, the hot shoe allows for attachment of external flashes. In addition to being a lightweight, user-friendly Compact Camera System, the G3 also provides the shooter with uncomplicated storage options. The internal memory card slot is compatible with SD/SDHC and SDXC memory cards. Of course, like most digital cameras today, files can also be off-loaded via the camera's USB interface. Other camera connections worth mentioning here include the mini HDMI, an A/V output, and the 2.5mm min jack. The 2.5mm jack allows for connection of an optional remote for hands-free control of the camera. 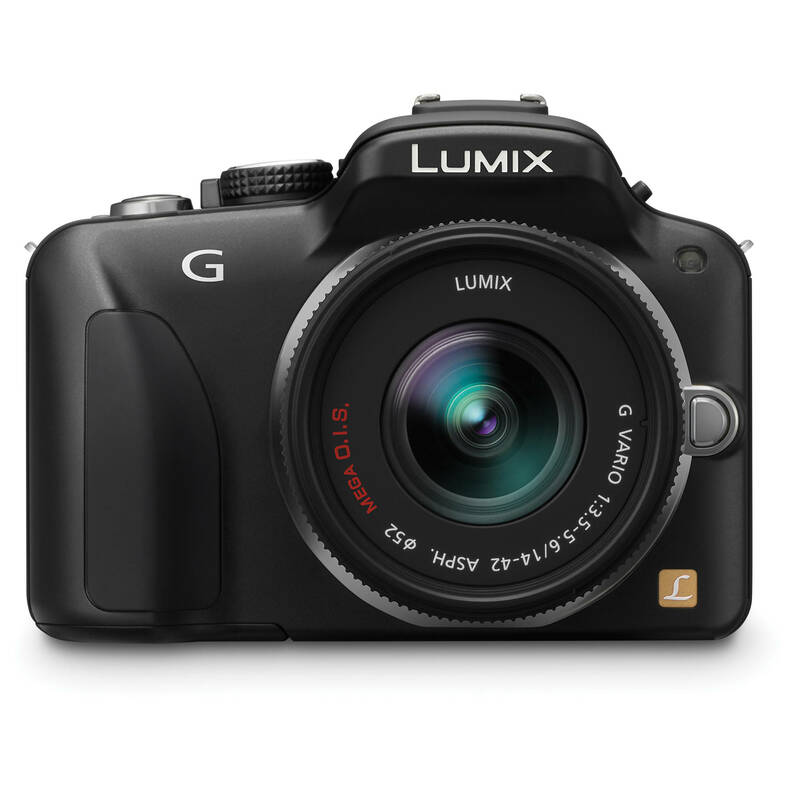 Box Dimensions (LxWxH) 7.5 x 5.7 x 6.3"
Lumix DMC-G3 Mirrorless Micro Four Thirds Digital Camera with G Vario 14-42mm f/3.5 - 5.6 Lens (Black) is rated 4.5 out of 5 by 116. Rated 5 out of 5 by Shooter from I love this camera. i purchased the G3as a replacement for a trusty canon G 10 which was stolen. With the kit lens I found myself unsatisfied. I then read the reviews on the 20mm 1.7 and decided to give it a try. I have not put it down since. Image quality is fantastic size is just about right and the touch screen and menus are a breeze once you get used to them. Why it wont replace my Canon 7D I take this camera everywhere get shots I would have lost leaving the 7D home (because of is size). Additionally, unless I'm printing larger then 11 x 14 or doing some major cropping I don't see a large drop off in image quality from the 7D. Rated 5 out of 5 by Anonymous from Love the DMC-G3 Have used the Lumix FZ-7; FZ-18 and latest FZ-35. Had to drop to 3MP to get any reach for bird photography. Looked at the latest super zoom compacts but the cost didn't seem worth the small increase in reach. Have been following the Lumix G series but cost was too much for me. But the new DMC-G3 made the size, 16MP and cost well worth the extra money. Intelligent Auto does it all for you unless you want the challenge of your own settings. Also bought the 100-300 lens which is 200-600mm in 35mm equivalent at full 16MP. Digital zoom 2X drops to 8MP and doubles the reach. Camera and both lenses are so small you can carry them in cargo shorts. The 4/3 camera and lenses is my way to go. Rated 5 out of 5 by bonitabeachguy from Great mirrorless camera After extensive research, I choose the G3 as my entry into the world of mirrorless cameras. I currently shoot with a Canon T2i with a collection of 4 lenses, including my favorite, the Canon 70-200 F4 IS. I wanted smaller, lighter, and something less noticeable and intrusive. I replaced the 14-42mm kit lens with the older 14-45mm. So far I have been extremely happy with this camera and its performance. The touch screen was not a factor in my purchase, but it has been easy and convenient to use. Sharpness out of the camera has been excellent, at times requiring no PP in Lightroom. The only feature that has not impressed me so far is the EVF. In another month or two, the Canon gear goes to one of my daughters. Rated 5 out of 5 by Chuck from Wow what a camera. I own the GF1, and this is my upgrade from that body. I read the reviews about the G3 and the GX1, and realized that I really wanted the built in viewfinder and the flip out screen. Being able to use the flip out LCD screen to focus by just touching the subject (in my case birds at rest) has resulted in a great many keepers. It doesn't matter where they are, just touch the screen and it will not take the picture unless the subject is in focus. This camera isn't any bigger than my GF1 when I used the attached EVF, but with the EVF being built in, I can also attach a flash unit to the camera. The touch screen has done away with my need for a cable release for most of the time. Focus has been dead on. Really happy with this purchase. Rated 4 out of 5 by Anonymous from Nice, light, good image quality The G3 is a very nice camera. It is small and light for a system camera, but not too small to be a useful photographic tool. The IQ is good, much better than a compact P&S camera especially at high ISO. The interface is good with enough buttons and dials to ensure you can get to everything you will need fairly quickly. The rear LCD is nice as is the EVF. The only negative is short battery life. The battery lasts about as long as a P&S, much less battery life than an SLR. Rated 5 out of 5 by Anonymous from No Regrets with this Camera I agonized over what camera to buy when moving from a superzoom. I checked on every entry-level DSLR and kept coming back to the G3. It offers the right blend of size/performance/features. The photos are great and the camera is a joy to use. The biggest pluses are the camera's clear, high ISO output, the clear viewfinder, and its small size. The biggest negatives are the manual and the battery life (it could be better, compared to a DSLR). Order an extra battery and it won't be an issue. The kit lens is ok, but you'll soon want more flexibility. I quickly added the 45-200mm and the 20mm. Rated 5 out of 5 by Anonymous from Makes you feel like a real photographer This camera takes excellent photos even if you don't know how to use it beyond the Intelligent Auto function, but it's so good that it makes you want to learn more about how to control your own photographs--and it makes it easy enough to do so. Sometimes it can be hard to get the Auto Focus to focus exactly how you want it to, but there is a manual focus and there are many different settings for the Auto Focus to help you get the picture you want. I did receive this product as a gift, but for my purposes (a blogger who needs to produce excellent photographs of food, knitting, and children) it is perfect. Rated 5 out of 5 by Anonymous from POWER IN A SMALL PACKAGE I purchased this camera because I found I never carried my DSLR anywhere due to size so I was missing photography opportunities. My main interest is in wildlife/birding photography with Panasonic 100-300 OIS and general family/pet photography with Panasonic 20mm. This is a great camera for portability, reach and is right up there with focusing speed, etc. So far I have nothing to complain about and I find myself taking the camera when I usually would have left a DSLR behind. Results have been excellent so far.